Mexico has long had lax enforcement of passport requirements for travelers entering the country through land borders with the United States. Travelers entering by car or on foot have not been required to present passports to enter Mexico, although they are required to return to the US. However, those standards are changing, and the San Ysidro/Puerta Este border crossing is leading the way. Effective now, pedestrian travelers entering Mexico at the San Ysidro/Puerta Este crossing must show a valid passport and fill out an entry form. Travelers who will remain in Mexico for more than one week will also need to pay 326 pesos (approximately $20) for a Tourist Card valid for 180 days. US citizens are not required to obtain any visas in advance of entry to Mexico. 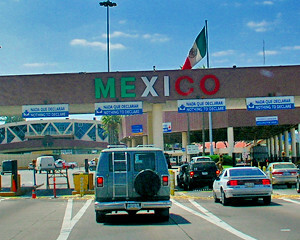 The Puerta Este border crossing at San Ysidro, California serves traffic between San Diego and Tijuana. With 22,000 travelers crossing the border into Mexico every day, it is considered the busiest land border crossing in the world. Travelers entering Mexico on foot are now received at a brand new, $6.9 million building. Unlike other Mexican border facilities, the new Puerta Este building has separate entry lanes for Mexican and non-Mexican citizens. This is intended to speed the processing of travelers passing through the border. The new facility and enforcement of passport requirements at San Ysidro/Puerta Este are meant to be a model for all other border crossings in Mexico to follow. However, Mexican immigration officials are already saying that they may relax the passport requirement for incoming pedestrians during peak times when lines grow long. Travelers entering by car are also still exempt from showing passports to enter Mexico. Although the majority of travelers entering Mexico by land continue to be able to cross the border without a passport, it is very important to remember that a passport is required to re-enter the United States. US citizens can use a passport book, passport card, enhanced driver’s license, or SENTRI card to prove their citizenship when returning to the US by land. Passport books are required for all travel by air to Mexico or any other international destination.